There are many different organizations that provide International English Examination certificates. 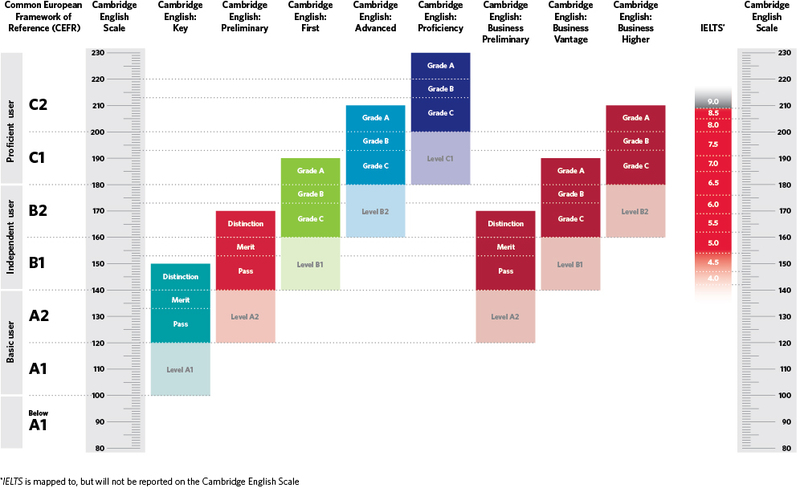 Two of the most widely accepted are Cambridge and IELTS. What do you mean for you? But usually they will be at the same level. You need to check with the organization first. Here is a list of real life levels. This is a basic qualification qualification. A Cambridge English: Key (KET) qualification is proof of your ability to use English to communicate in simple situations. It will give you the confidence to go on and study for higher-level exams. Proves you have the language skills to live and work independently in an English-speaking country or study on courses taught in English. The highest-level qualification – proof that you are a highly competent speaker of English. Learn the practical language skills you need to start doing business in English. With a Cambridge English: Business Higher (BEC Vantage) qualification, now you have the practical language skills needed to work effectively at a senior level in international business. With this certificate you show employers you have worked for and reached the highest level of business English. IELTS is widely accepted by Educational institutions, employers, professional registration bodies and government immigration agencies who often require proof of English language skills as part of their recruitment or admission procedures, especially in the USA. Over 2.5 million tests are taken each year. Academic - is for those planning to study in higher education or register for professional registration. General Training - focuses on basic survival skills in both social and workplace settings. Usually it is for those who are going to English-speaking countries to do secondary education, work experience or training programs.